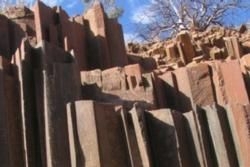 The beautiful organ pipes are a fascinating geological formation located near Twyfelfontein. Strikingly rich rusty colors are portrayed in long columns resembling those of a church organ, some rising up to 5m high. Thought to be the result of the Gondwanaland breakup, fractures and cracks were formed as the dolomite columns cooled through the process of columnar jointing approximately 120 million years ago. Just a short walk from the Organ Pipes is a small inselberg named the Burnt Mountain, proclaimed a national monument on 15 September 1956. The reason for its name is best evident in the early mornings and late evenings when the rays of the sun seem to set the mountain ablaze. Rich red colors mixed with shades of black and purple are quite strikingly caused by Manganese coated clay molecules. During the day, however, the inselberg is just a normal black color as if the morning fire has burnt it to ashes.